WAGNER - Die Statt Malacca in Indien. Title : Die Statt Malacca in Indien.. Date : Augsburg, Koppmayer, 1685. Size : 6.9 x 11.1 inches. / 17.4 x 28.2 cm. Description :Panoramic town-view of Malacca, published in Wagner, "Delineatio Provinciarum Pannoniae". Unsigned engraving. The engravings for Wagner's book were executed by Johann Christoph and Melchior Haffner. Extensive V.O.C. and Chinese shipping in the foreground, and the town (the historical city center has been listed as a UNESCO World Heritage Site since 7 July 2008) in the back ground. In April 1511, Afonso de Albuquerque set sail from Goa to Malacca with a force of some 1200 men and seventeen or eighteen ships. They conquered the city on August 24, 1511. It became a strategic base for Portuguese expansion in the East Indies. The Jesuit missionary Francis Xavier spent several months in Malacca in 1545, 1546 and 1549. In 1641 the Dutch defeated the Portuguese to capture Malacca with the help of the Sultan of Johore. 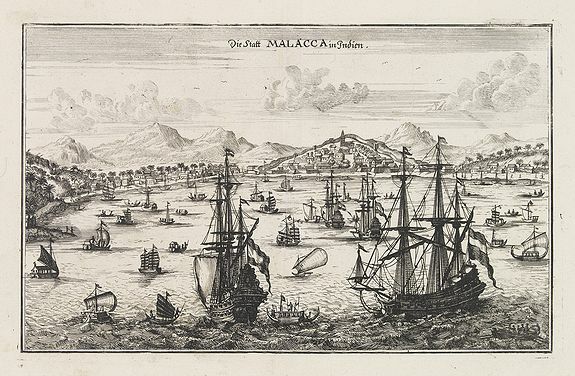 The Dutch ruled Malacca from 1641 to 1795 but they were not interested in developing it as a trading center, placing greater importance to Batavia (Jakarta) in Indonesia as their administrative center. Condition : Overall very fine condition. Some marginal light staining.